Through the scripts , is possible automatize the creation of the machining operations and the geometries. In this way , you can create scripts to speed up your common workflow or expand the software capabilities. This is a newly added feature (January 2018) , so if you have some feedback about it or you can&apos;t cover a particular scenario, please send me an email . Is possible copy and paste existing scripts from this documentation site , or create them on your own , but in this case a minimum of programming skill is required. The programming language to create these script is C# . All script file have .CSX extension. Since it&apos;s a experimental software feature, you need to enable the related user interface control through preference dialog. From Menu -> Edit -> Preference -> search "Show Command Line" and enable it , save and close the dialog. Now in the bottom window you can see this control. Click on this bottom to clear the command line . This below is the interface of the script editor. On the left colum you can find the existing script in your library. 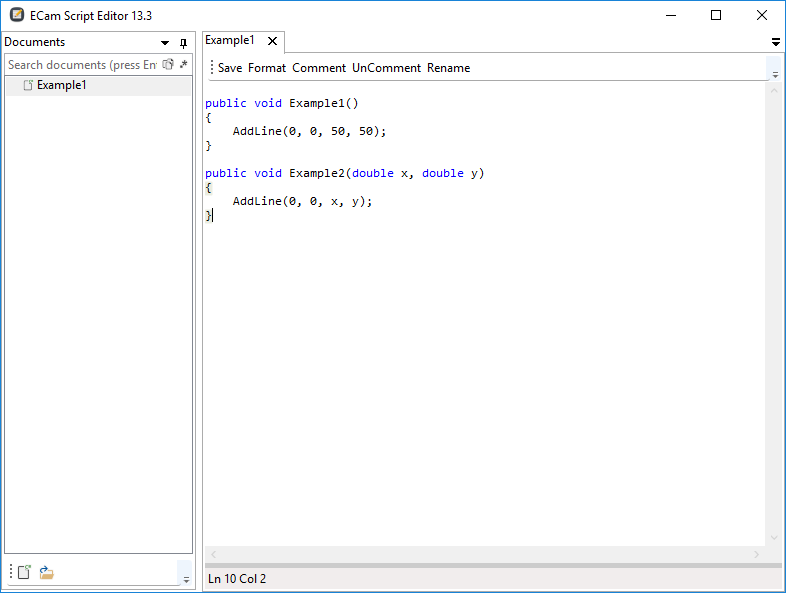 On the right is visible the text editor. It&apos;s available code contextual autocompletion and error report on the fly. If there is something wrong a red indicator will appear under the related code . You can import ( or export ) script files by just moving them in this directory. To add a new script file , click on the white button in the bottom left window. Through the tutorials you&apos;ll find further functions examples, but if you need deeper explanation, search documentation about C# language on google. You can insert comments into script file . The comment are ignored by script execution. "ECam script editor" is a forked project of RoslynPad created by Eli Arbel.